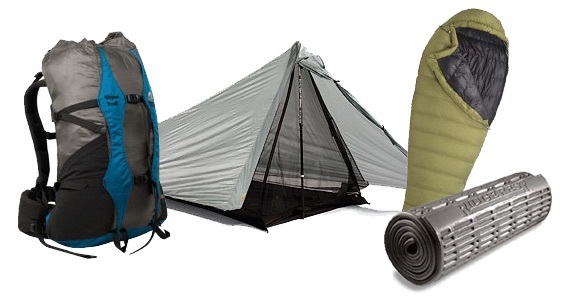 Any article on lightweight backpacking mentions the big three; Tent, Sleeping Bag and Pack. Two recent experiences have led me to believe the attainment of lightweight enlightenment with regard to the Big Three is more elusive than previously credited. In the first case, a friend is in the first couple weeks of her Mountain-to-Sea Trail thru hike across North Carolina and she is experiencing the typical break-in period most thru hikers face: shaking down equipment, initial confrontation with less than desirable physical condition and the realization this is going to be hard. And like most freshman thru hikers, there is the inevitable effort to lose pack weight. I had provided some pre-hike coaching and helped her shed a few pounds but when we had a telephone catchup, she was still hauling over 30 pounds. So we went through everything, item by item, starting with the Big Three. She reported to me that her sleeping bag, pack, tent and sleeping pad still weighed about 17 lb. which couldn’t be true because the tent and bag were only about 5.5 lb. together. I know because I loaned them to her. The pad was another pound and finally we got to the root of the matter. Her pack weighed nearly 7 lb. empty. She bought a good pack from a reputable outfitter. No blame here but a 7 lb. pack for someone less than 5’6″ was a bad fit. Now to the second part of the story. Yesterday, upon returning from a day hike with a friend on West Prong Trail, I engaged in one my my favorite post hike celebrations in Maryville. That being a stop at Little River Trading Company. I wanted to share what wisdom I could on backpack choices. A helpful sales guy was right there at the backpacks and was quick to engage us. I stood back and listened to his approach to see where he would lead my friend. He asked to typical questions like, “what kind of hiking are you going to be doing?” At no time did the question of weight come up. My friend’s attention was directed to a popular brand with plenty of room and would certainly meet his technical needs. But pack weight was never discussed, even when I suggested the lighter weight brand I prefer. Sales people are no doubt helpful but it is my contention they rarely steer the novice toward the lightweight options unless pressed to do so directly. With packs, the thing is size and suspension technology. With sleeping bags, it’s temperature rating and price and with tents, well I’m not sure because I’ve never bought one from a store. And this is why my Mountain-to-Sea Thru-hiker friend is carrying over 25 lb. in base pack weight. So here are two basic rules when looking for one or more of the Big Three, or any other piece of gear. The maximum target weight for the Big Three combined is no more than 9 lb. total weight. Breaking that down, target 3 lb. for a tent, 2.5 lb. for a summer weight sleeping bag and no more than 3 lb. for a pack. It’s not difficult to do less weight but you start to run against cost, especially with sleeping bags. Tent’s and packs weighing 3 lb. or less each are no less durable or more expensive than any others. Beware the popular brands that offer a lot of features and technology. That translates to cost and weight. My North Face summer down bag weighs about 2.5 lb. and my Eureka one-man tent weighs barely 3 lb. Neither came with a hefty price tag and both can be found on sale for $150 each or less. My ULA Circuit holds 4,200 cubic inches and weighs 2.5 lbs. It sells for $235 which is comparable to other major brands. Total for theBig Three in this example: 8 lb. Outfitters offer a great service and they desire to get you quality gear but like any other sales person, if you go in without some prep work, they will make recommendations based on their priorities, which is to sell you the best pack in their opinion. They may not put pack weight at the top of the list of most desirable features so you will have to. Pack weight should be number one after good fit. Size should be secondary. 3,500 cubic inches is plenty for week long trips as it is quite enough for through hikers. Sales people may direct you to bigger packs so you will always have enough room for whatever but size adds weight. Most popular brands have lightweight models at reasonable cost. You just have to ask. This entry was posted in Philosopher's Guide on April 4, 2016 by blogginggazelle. 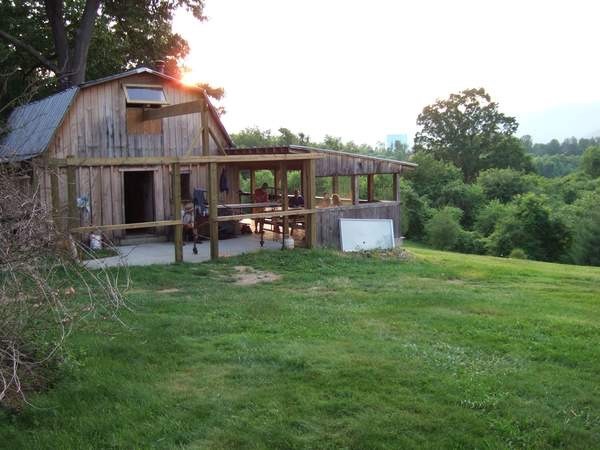 Holy Family Hiker Hostel in Pearisburg, Va. It was the at the Holy Family Hiker Hostel in Pearisburg Va. when it happened. It was early June and I had just arrived to find a gentleman checking out the hiker register. The Runner… THAT’S IT! Some 600 miles into my AT Thru Hike and I had a trail name. And it came from one of the folklore heroes of the AT. Warren Doyle has hiked the AT 16 times and at one time, held the speed record. I hadn’t chosen a trail name at that point but I was aware of the tradition. Some chose their trail names before they begin their hikes. Some believe it should be bestowed upon you while on the trail. I guess in my case it was more of the latter. Adopting a trail name is part of the long distance hiker community. Most Thru Hikers on the AT and PCT alike take on some form of alter ego. The name may come from a specific event or it may refer to some aspect of personality. Mouse Slayer carried mousetraps to ward off the beasts in trail shelters. The Umbrella Lady carried, well you know. There was The Snail, The Old Soldier, Hog, Moses, TomNBev and The Exodus and many many others. From Pearisburg on, the thru hikers I met become known more by their trail names than their given names. It always made introductions interesting. A good trail name should come with a good story. Being a fan of the Hitchhiker’s Guide, I even gave my pack a handle; The Runnership Jansport America. The 900 Miler community hasn’t seemed to embrace the tradition, perhaps because most of us are not Thru Hikers. Furthermore, there is no system of communication like the shelter registers in which to document our experiences through our chosen identities. We tend not to congregate at campsites and hiker hostels. Becoming a 900 Miler does not involve a full-time commitment like being a Thru Hiker. We don’t leave behind our civilian lives for the duration of the trek, which diminishes the need for an alter ego. And yet, there were 30 who became 900 Milers in 2015. There are more than 475 900 Milers registered with the 900 Miler Club. Maybe there is a critical mass necessary to ignite the use of trail names in the 900 Miler community. If you track the list of AT Thru Hikers over the past several decades, it wasn’t until the 1970’s that trail names started to show up at all. The critical mass seemed be reached in the 1990’s and by 2000, it was unusual for a Thru-Hiker not to have one. Saunter – John Muir rejected the notion that he was a hiker. Borrowing an idea from H.D. Thoreau, he explained that saunterers were spiritual pilgrims who traveled by foot and he preferred the term. Wayfarer – is a person who travels rather leisurely by foot. Plus, the name reflects my chosen form of protective eyewear. Strider – reflects one who travels by foot but more swiftly. It is the nickname used by Aragon in the Lord of the Rings while he was a Ranger of the North. Mysterious! This entry was posted in Philosopher's Guide and tagged 900 Miler Club, Trail Names on January 18, 2016 by blogginggazelle. Every year, there is a least one story that makes the local press about an individual who got lost in the Smokies for a day or two until the park service found them, cold and hungry. Recently, there was a family of four who spent a miserable cold night up on Mt. Le Conte. It seems despite the fact that the trails are well marked and the availability of good maps, people still manage to venture out in street shoes with a small water bottle and little else. In full disclosure, I must admit that I have been lost once. The map I had was several years old and the Lakeshore Trail had more recently been rerouted. The campsite we were bound for did not materialize within the expected timeframe and the topography on the map indicated a much different terrain than what we were currently hiking. We were supposed to be on the Lakeshore Trail and the last sign we passed confirmed that in fact we were… on the Lakeshore Trail. We were just on the wrong Lakeshore Trail according to my obsolete map. Fortunately, we encountered a fellow wayfarer who was in possession of a newer and more accurate map. Given that we were backpacking, we were never really at risk and we were soon properly oriented and back on track. The point is, everyone gets lost, sooner or later. Much of my hiking is done solo for personal and spiritual reasons and 900 milers hike trails that are in the far reaches of the park where the maintenance crews rarely visit. The possibility for an obscure trail without a sign is there. Even with a hiking companion, water bottles are lost and food is forgotten. And in the case of injury, one of the party may have to get help while the other party hunkers down to wait for rescue. With proper planning, the folks at home should know where you are going and when you plan to return. So if you are somehow lost or injured, you need to be prepared to survive a night in the backcountry. Navigation – To date, the National Geographic map of the Smokies has proven to be a stellar method. I also carry a compass although it is rarely consulted. My watch has an altimeter feature and a compass so with the map, I can usually locate my position within a quarter mile or so. I have yet to be enticed to acquire GPS systems. Cell phones can work but they cannot maintain a battery charge for very long. 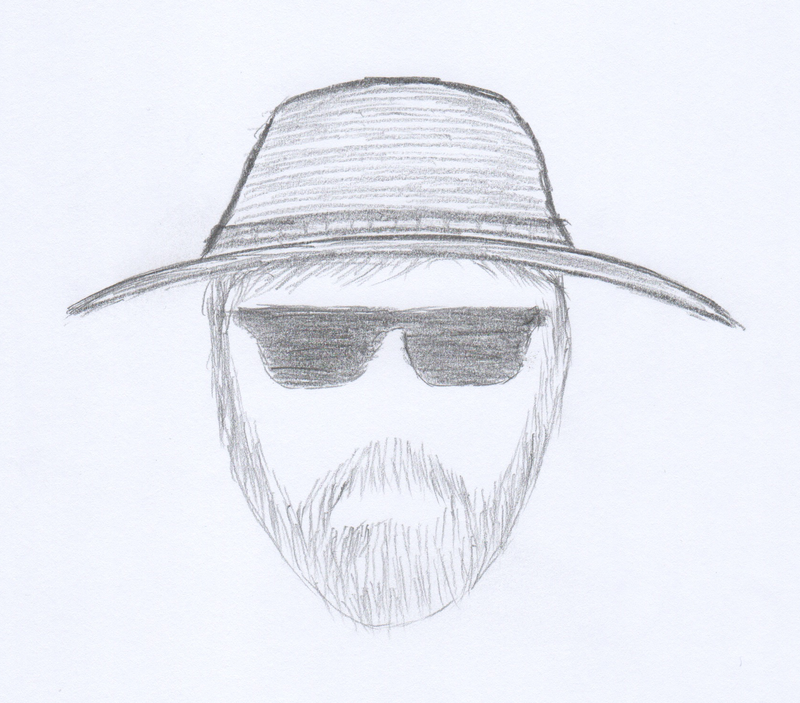 Sun Protection – Hat and sunglasses. If I anticipate spending an afternoon on a bald, I may carry sunscreen as well. Insulation – At the very least, even in summer, I take a fleece and my rain jacket. In the winter, I add layers, gloves, a warm hat (beanie, toboggan, ski cap, skull cap, or touk, eh? ), rain pants and a down jacket. First Aid Supplies – The outfitters have small lightweight individual first aid kits with all the essentials. I typically add Vitamin I (ibuprofen), a small tube of Neosporin, and a chaffing cream of some sort. Fire – Waterproof matches in a plastic waterproof case. I also cary a lighter but the matches are lightweight and a good failsafe. i also carry a couple sticks of fire-starter material. It rains all year in the Smokies. Scoutcraft aside, it helps to have a quick way to start a fire. Repair Kit and Tools – A lightweight pocket knife and a small bit of duct tape. Nutrition – I always throw in extra granola bars and plenty of GORP and nuts. Hydration – a water bottle and a Sawyer filter. Emergency Shelter – Interestingly enough, this list did not specifically call out rain gear, which is a serious oversight. Although I included rain gear in the insulation discussion, I always carry a rain jacket. In cooler situations, I’ll throw in the rain pants. The advice here also calls for a light tarp, something which I rarely have carried on day hikes but I do have silnylon rain poncho that could serve as a tarp. Knowledge – There is always the “plus one”. In this case it’s knowledge. a compass won’t do you any good if you don’t know how to use it. Starting a fire in a fireplace with dry newspaper and a lighter is easy at home, but in the rain with wet wood is a whole other matter. Setting up a tarp in the wind requires some skill. Proper planning identifies routes and return times. All of these items stay in my day pack or in close proximity. The list helps to make sure the down jacket makes it in the pack. There are most certainly other items you may consider essential so feel free to modify the list to include those. And lightweight considerations need not be sacrificed. My day pack rarely weighs more than 7 lb., even with water and winter gear. This entry was posted in Philosopher's Guide and tagged 10 Essential Systems, 10 Essentials on January 10, 2016 by blogginggazelle. You cannot walk far in the way of Ultralight Backpacking without running across those who are passionate about their alcohol stoves. And why not? They are extremely light and you can make your own at very minimal cost. What’s more, there are many websites dedicated to showing you how to make and use your own stove. One in particular is www.thesodacanstove.com. This site has great instructions on how to make different stoves and it has a well done comparison between all the main types of cooking methods including open fire, wood stove, canister and liquid fuel, alcohol and solid fuel. 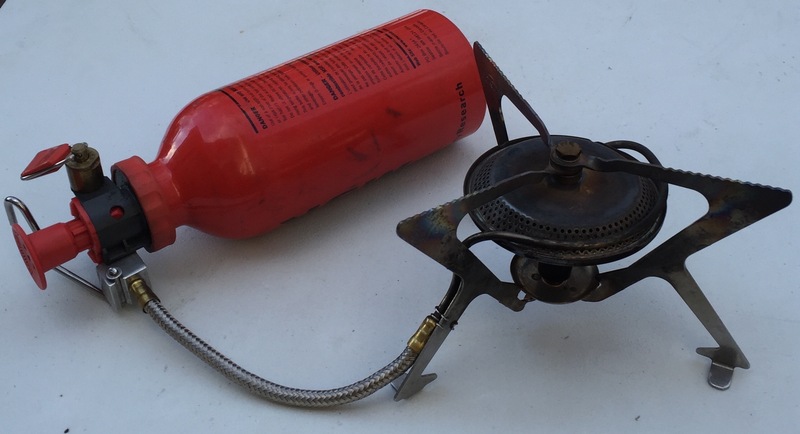 One thing that most of the websites I have seen are lacking is how the alcohol stove compares with others in terms of how much time it takes to boil water. As you will see, this amounts to a significant omission. In full disclosure, I am no where near achieving Zen status when it comes to the alcohol stove. There are a lot of designs and I am sure some are more efficient than others. However, the few videos I observed on the topic confirmed my results as being in the ball park. For this test, I chose the popular cat food can design. The website shows you how to make one. They are really easy. As for the other stoves in the test, they are from my own personal collection. While there are many designs and technologies deployed today, I believe these models exemplify each type of stove sufficiently for this purpose. They all have their advantages and disadvantages, which are pretty well known with minimal research. The main purpose of this test is to compare boiling times, weight and general cost of each stove type. The test was conducted in my garage with the door open. There was a bit of a breeze but not significant. The ambient air temperature was 63.7 deg. The altitude of my garage is 1337 ft. above see level and the barometric pressure at the time of the test was 30.05 in. of mercury. These parameters are significant in that they affect the actual boiling temperature and the time to boil the water. In order to make sure I had a solid reference, I heated some water and tracked the temperature until it stopped at 208 deg. at a full boil. I used my trusty flat scale to insure I used a constant amount of water for each test. I chose 12 oz. of water because that is typical for a single serving of freeze dried foods. 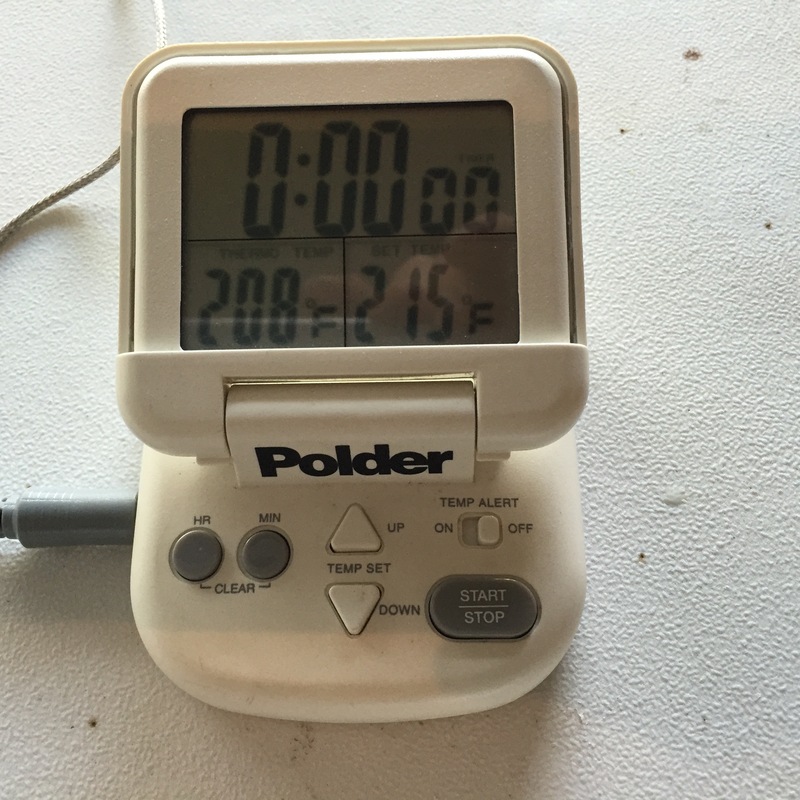 I used a typical digital oven thermometer to track the temperature of the heated water. I used a two gallon bucket to hold plenty of water and the temperature of the water from the tap was 62 deg. For timing, I used the stopwatch function of my wristwatch. The container I used was my 16 oz. titanium cooking pot. For each test, I dipped the pot in the bucket of water to make sure it started at the same temperature. The I used the scale to measure exactly 12 oz. of water. After lighting each stove, I adjusted to full flame. 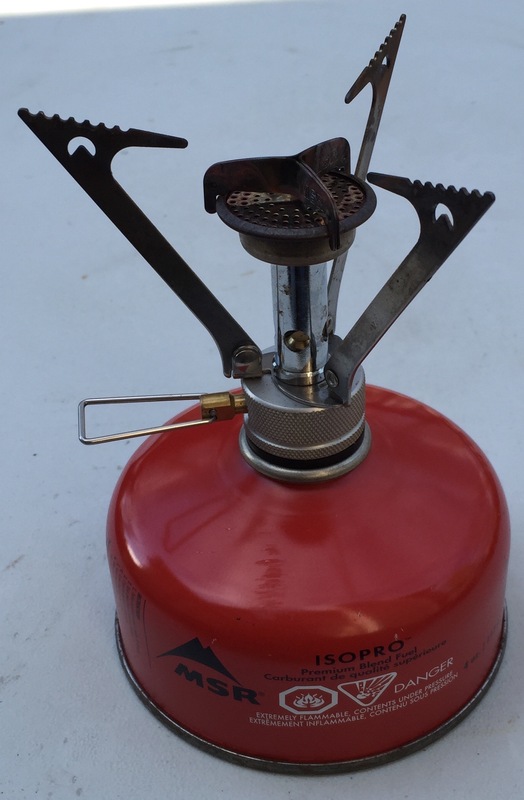 In the cases of the liquid fuel stove and the alcohol stove, I gave each enough time to warm up to the point of vaporizing the fuel. I set the pot on the stove and started to watch, tracking the time until the moment the thermometer read 208 degrees. It should be noted that I did not use a windscreen for any of the tests. They are discouraged in the use of canister stoves for safety reasons. For liquid fuel and alcohol, they can provide improvement but I decided to remove it as a variable. This is my current go-to model and I love it. It is a canister type and it is very small, compact and lightweight. I have been a white gas devotee since my Boy Scout days and I have used the MSR Whisperlite for many years. It remains a great stove choice for extended trips, colder temperatures and higher altitudes. It took about 15 minutes to make this stove with the can and a paper hand punch. The cat food, alas, was not necessary for the test and consequently, it was not spared nor donated for the benefit of any feline. It should be noted that the 1 oz. 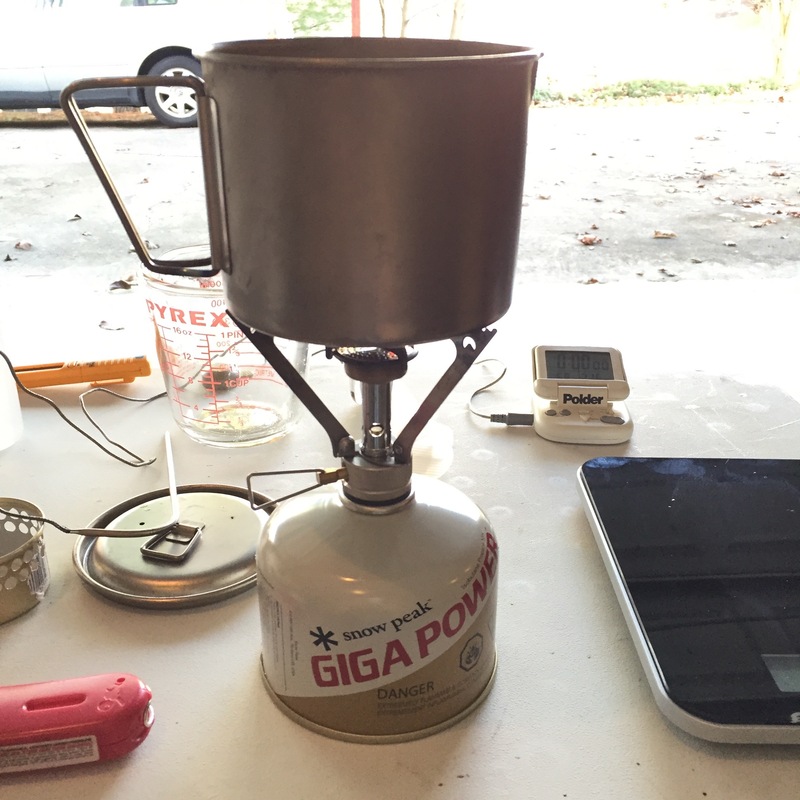 of fuel ran out during the alcohol stove test but I was able to refuel and relight within 15 seconds or so. I left the total time because in the end, it did not seem to be significant. 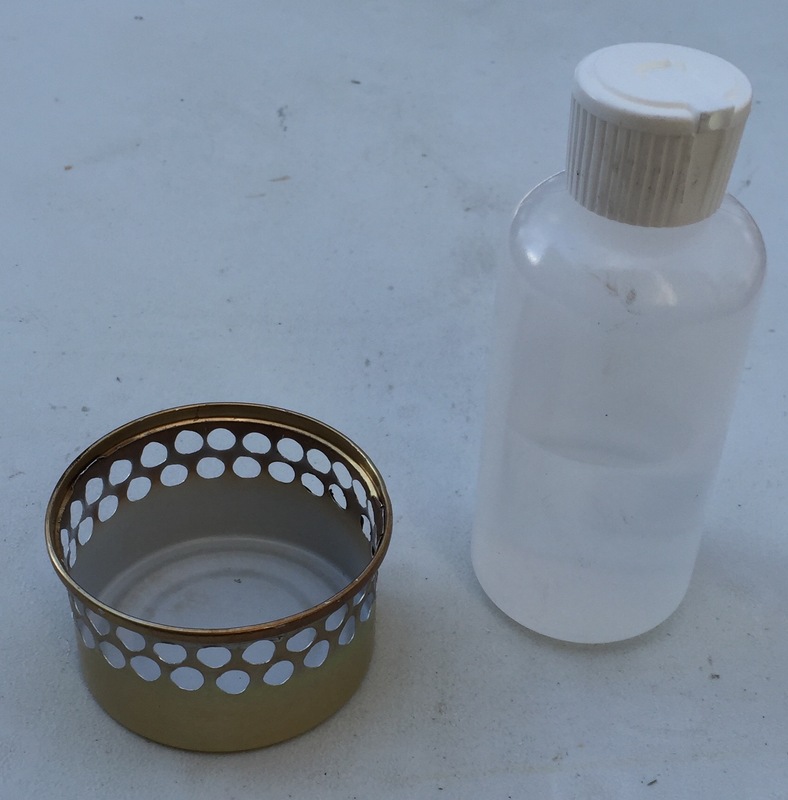 There is a clear advantage in weight and cost of the homemade alcohol stove but a significant price is paid for boiling time. For 6 oz. in exchange for 9 minutes, I think I’ll stick with the Pocket Rocket! 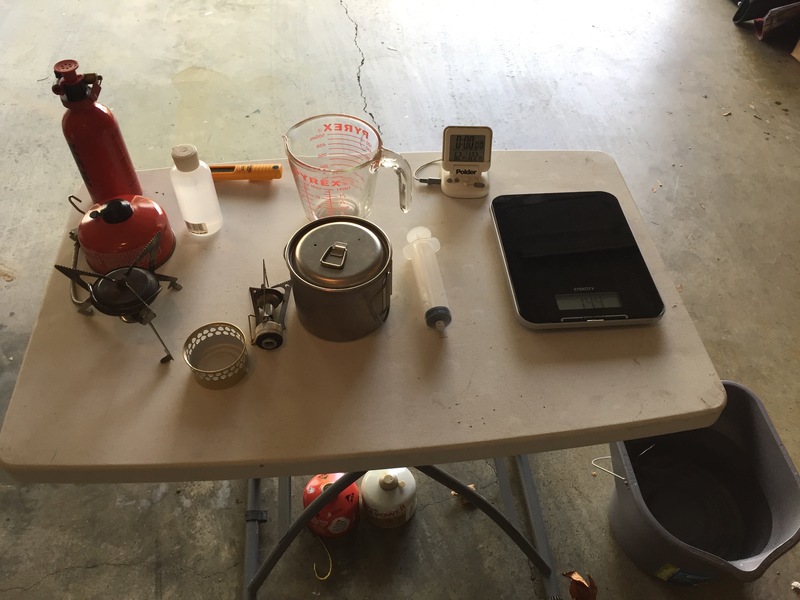 This entry was posted in Philosopher's Guide and tagged Alcohol Stove, Backpacking Stove Test, Canister Stoves, Cat Food Can Stove, Liquid Fuel Stoves on December 29, 2015 by blogginggazelle. On the heels of reading “Trail Life” by Ray Jardine, I decided to start a series of posts on the topic. As we go, I will highlight aspects of my personal gear, how I chose to buy it and generally how well it has performed. So to get things started, let’s talk a little about the essence of Lightweight Backpacking. As any disciple of “The Ray Way” knows, it’s not about lightweight for it’s own sake, although every philosophy has it’s most ardent supporters (and shall we say extremists?). The purpose is to lighten the load as much as possible to heighten the hiking experience, by extending the hiking day, adding mileage, reducing pain and injury and generally feeling better. There, after you list all of your unnecessary stuff, it really adds up. This list represents about 9 lb. The next step on the journey of lightweight is to purchase a scale and weigh everything else. 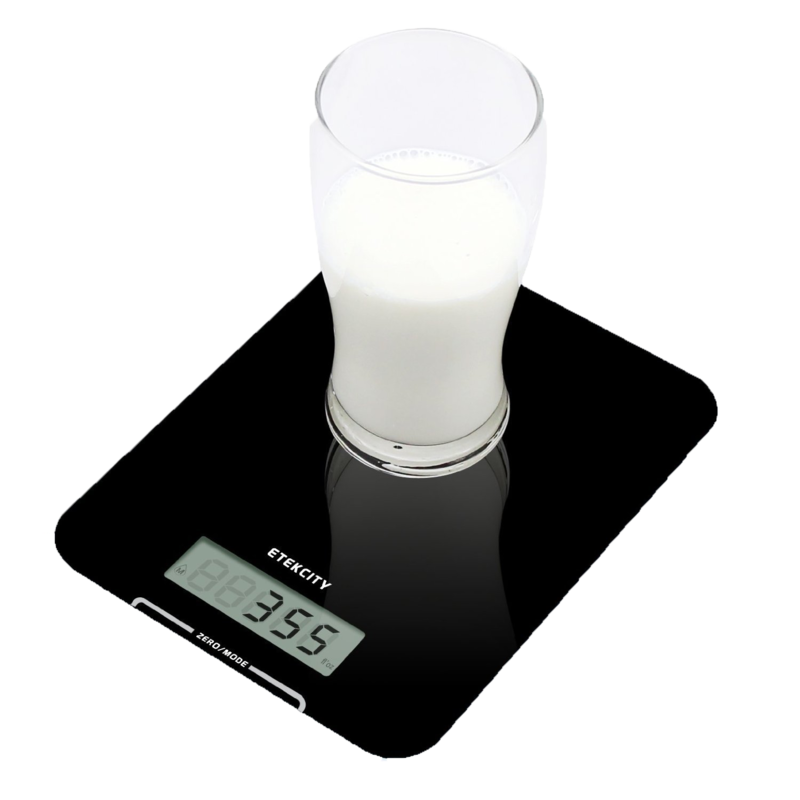 I found a good digital scale on Amazon: the Etekcity 9310 It’s only about $12 and it has a large surface. Start a list of your go-to gear and weigh each item. Just knowing the weight gives you useful information. Those desiring to lose body weight count calories. Just having awareness of this information has an impact on the choices you make when deciding to order desert after that great pasta meal. Being aware of the weight of all your gear puts you in a lightweight mindset. From then on, you make more informed decisions about what to carry on a day hike or weekend backpacking trip. Is the fleece lighter than the insulated jacket? Extra pants that are never worn are more likely to be left in the dresser drawer saving a half a pound. That can of beer or soda… is it worth an extra pound? Developing an awareness of the weight of gear also has a positive impact on your buying decisions when replacing worn out gear. For instance, the weight of packs varies dramatically among vendors and models. Bigger and more featured packs can weigh up to 6 lb. whereas there are excellent choices that weigh half that. Ultra light models are less than 2 lb. A great habit to lighten your load is to review all the gear you carried at the end of your hike. Look for any unworn clothing or any unused cooking gear. The book you carried and didn’t read. Did you carry more food than you ate? Did you end up with a half bottle of fuel? 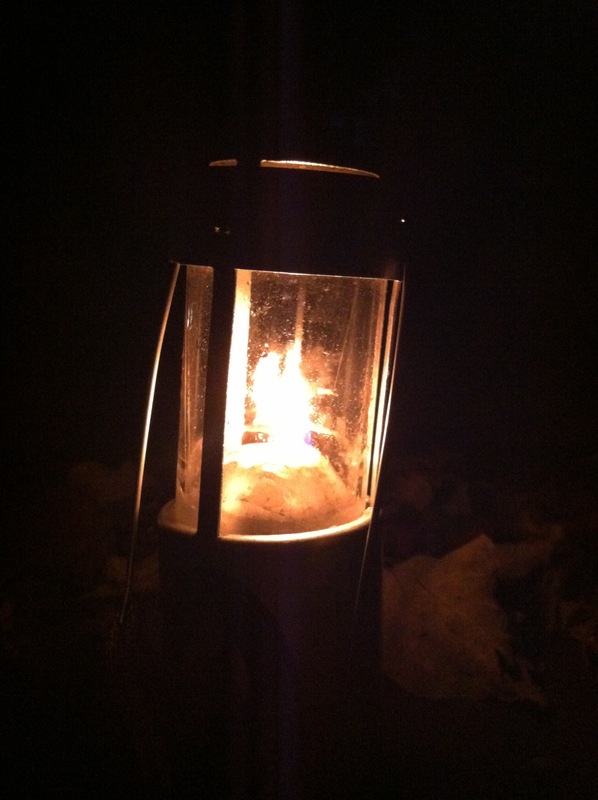 What about the candle lantern? Of course some equipment like rain gear is carried in hope that you don’t need it. But it should still be scrutinized as to whether it was absolutely necessary. I used to carry a poncho and a Gore Tex Rain suit. OK, the poncho doubled as a ground cloth but I never used it in the rain and there are lighter materials for ground cloths. I go back and forth on camp shoes. They are nice to have around camp but since I have started wearing lighter weight runners to hike, I often get home to realize the sandals I carried never hit my feet. The same is true for hiking poles. I used to carry a pair all the time but I began to realize that they were most helpful in fording creeks and the rest of the time, I was just carrying them. I would get tired of that and lash them to the pack. Now I find a good stick to get me across the creek and I toss it on the other side. Wearing your rain pants to around camp rather than an extra pair of long pants. Eating out of food pouches and pots rather than carrying a bowl or plate. So the first and most impactful step toward lightening your load costs no more than a cheap scale. The next post will discuss tradeoffs and additional skills that are involved with lightweight hiking. 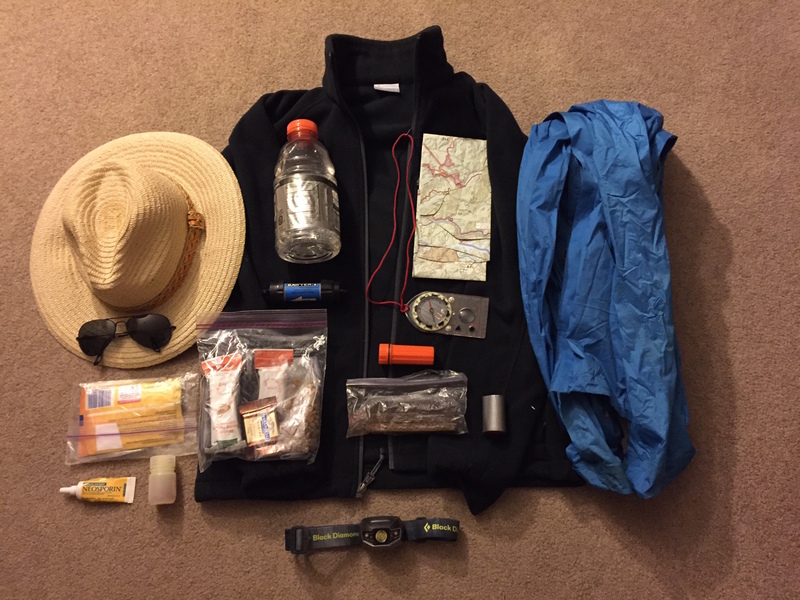 This entry was posted in Philosopher's Guide and tagged Lightweight Backpacking on November 8, 2015 by blogginggazelle. 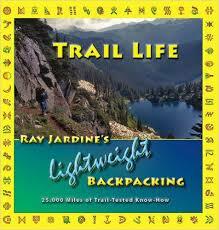 Any cursory research into lightweight backpacking will inevitably lead to the name, Ray Jardine. In fact, disciples of Ray’s hiking philosophy refer to it as “The Ray Way.” Ray and his wife Jenny have logged numerous long distance trail hikes amassing over 25,000 miles. Along the way they have systematically tried hundreds of equipment options and combinations to cut the overall weight of their packs to crazy minimum levels. In the end, they make most of their equipment for a number of reasons but mostly, because they cannot find optimal designs in commercially branded products. Throughout the book, Jardine points out that although he and Jenny are able to cover 30 plus miles a day, they rarely hike faster than a normal day hike pace of 3 miles per hour. In fact they probably rest more often then most, taking breaks every hour. The combination of proper hydration, nutrition and light weight packs keeps them from exhausting themselves, which in turn allows them to hike several hours per day and still get a good night’s sleep. Jardine makes the bold statement that all of us know deep inside; Your feet are going to get wet! There, it’s out there. There is no form of footwear that will protect your feet from moisture and unless you are in special deep snow conditions, there is no need whatsoever for heavy insulated stiff soled boots. All the heavy designs that include micro-pore membranes just add weight and cost. Stiff boot designs actually hurt your feet by not allowing them to move in the way they were designed. The ultimate solution is running shoes. They are light, reasonably robust and when they get wet, they dry quickly. They don’t build up heat and friction that can cause blisters the same way boots can. And they break-in quickly which is good because on a long hike, you will run through several pair. Jardine makes the claim that tarps are actually drier and therefore cooler in summer and warmer in winter. The basis for the claim is that tarps allow air to circulate and remove moisture generated by our bodies when we sleep. We exhale up to two pounds of moisture when we sleep. Tents accumulate this moisture causing more perspiration during sleep and higher moisture content in your immediate environment. This higher moisture content impedes the warming efficiency of sleeping bags. Furthermore, wet clothing dries much better under a tarp than in a tent. Jardine is adamant that successful camping with tarps relies on the choice of the campsite, which is a topic he devoted much time to under the theme, “stealth camping”. Jardine is fiercely anti-name brand. In a well thought out argument, he points out that the brand name equipment providers are in business to make a profit and one of the variables in making a profit is to minimize costs. This manifests in cheaper and less quality components in even the best brands of equipment. Zippers, seams, glues, fabrics, coatings; all things that are weak points in equipment thats lasts and performs well. If he uses a branded product at all, he will take the time to cut off the label or scratch off the decal. Equipment designers will compensate cheaper with heavier or larger. Tents have way more fabric than they really need to do their job. Sleeping pads are usually cut too big. Clothing rarely fits well as it is sized to the average, including shoes. The Jardines ended up making most of their equipment and they generously provided their designs and patterns in the book. They make their tarps, sleeping quilts, packs, and most of their clothing. What equipment they choose to buy, Ray will make substantial modifications to eliminate useless parts and unnecessary weight. All adjustment straps are cut off. Tongues are cut out of shoes. Waist belts are eliminated because they are not necessary with a pack weighing less than 20 lbs. Perhaps the most notable pieces of equipment the Jardines carry are their umbrellas. They provide protection from rain, shade from the sun and when held properly, a little wind protection. When hiking in the rain, there is virtually no way one can keep dry by donning rain gear. The Jardines attest that an umbrella will keep the upper body generally dry, which is the best solution they have discovered. Desert hiking can be treacherous and once again, the umbrellas are better than hats and sunscreen, especially when you adapt a piece of mylar (Space Blanket for the brand conscious) to fit over the top of them. The mylar substantially reflects the heat away from the body. Ray makes rather extreme modifications to the umbrellas by cutting off handles, springs and tyne supports. Ray Jardine’s equipment designs require some skill in their use and in some cases, a change in the typical methods. Using tarps requires some skill in choosing a site and in the setup. Using non-processed foods requires a lot of preparation ahead of time. Making your own equipment takes time and effort. In every case, Ray provides the rationale for his choices along with details about how he employs the specific piece of equipment. 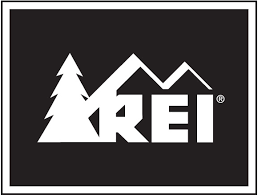 There are even chapters devoted to finance, choosing partners, personal hygiene, high milage hiking and what they term, “trail shock,” which is the combination of physical and mental stress one goes through when embarking on a long distance hike. The Ray Way is more than just a long distance hiker’s folklore philosophy. There is plenty of wisdom for day hikers and weekend backpackers. There are enough adventures and life stories to keep it a fun and light read and the pictures are beautiful. Just don’t take it with you to read on the trail. This entry was posted in Philosopher's Guide and tagged Lightweight Backpacking, Ray Jardine, Trail Life on November 2, 2015 by blogginggazelle.